When it comes to nature photography, some people have very strong opinions regarding the inclusion of man-made objects in an image. Personally, although I never used to be as vehement as those that would claim that the inclusion of any man-made object no longer allows the photo to be classified as an image of nature, I did always tend to exclude 'man-mades' from my photographs. Recently, however, I have loosened up in this regard. In fact, I have found that, at times, the inclusion of man-made objects can enhance the message or the effectiveness of an image. I was photographing in a small city park and became interested in a field of snow with trees in the background and felt that the scene conveyed a feeling of loneliness. I also found myself intrigued by the fact that there was snow on the ground and yet the trees were still holding on to many of their autumn leaves, which seemed to contrast the seasons. Try as I might, I just couldn't compose a 'nature photograph' that I thought was effective. 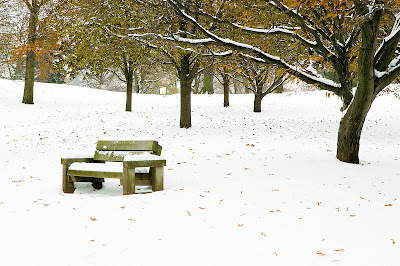 However, when I allowed myself to include the park bench, I began to come up with compositions that I felt were much more expressive and effective at conveying the feeling of loneliness that I was after. Some might well say that I haven't 'proven' anything regarding the inclusion or exclusion of man-made objects in nature photographs. In fact, they might say that all I have done is taken a photograph that attempts to convey a certain feeling......but it's not a nature photograph. Fair enough. But my response is 'who cares'. I believe that, at times, we might be best served by not trying to rigidly classify images or photographic genres. In the past, because I was trying to do 'nature photography', I might have not taken this shot, which I rather like. Perhaps when going out to photograph nature one would be well served by keeping an open mind about what he or she might be willing to include in a photograph.